The most interesting car Honda currently makes isn’t the reborn NSX, or the Civic Type R, and it’s definitely not one of its hybrid hatchbacks or crossovers. 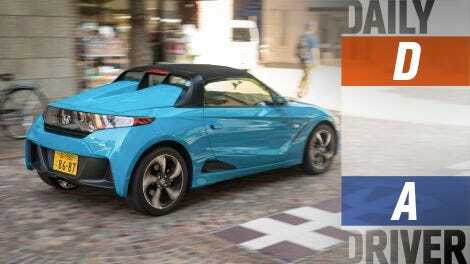 It’s the Honda S660, a mid-engined baby roadster with a peppy engine in the middle, rear-wheel drive and a removable roof. And you can’t own one. 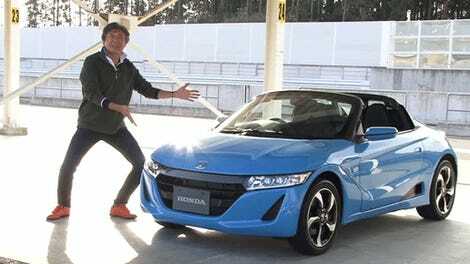 There’s nothing I can do to fix the fact that, like its predecessor the Honda Beat, the S660 is only sold in Japan at the moment. But it’s proof that Honda’s really back to doing fun things, and that good things can come in small—albeit compromised at times—packages. First and foremost, the S660 is a kei car. Basically, it’s a type of mini-car regulated by Japan’s government for bare-basics motoring. Kei cars can’t be longer than 3490 mm (137 inches) or wider than 1400 mm (59 inches) and must be powered by a three-cylinder engine no larger than 660cc. Everything else is up to the manufacturer. Most kei-cars are tall boxy van-type bodies to maximize as much space as possible. That’s all very sensible, but then here’s Honda making something fun from a dull government regulation. Okay, Daihatsu beat them to the market with the Copen, but that’s front-wheel drive so therefore, as far as I’m concerned, inferior. But this is why you Americans don’t get the S660—very few kei-cars have historically been exported to the North American markets. They’re considered too small and too underpowered to sell well outside Japan. The S660 fits all the dimensional requirements for it be a kei car with a 660cc three-cylinder engine—but this one has a turbo attached to it. Power comes in at a very regulated 64 horsepower and has 76 lb-ft of torque, all of which is sent to the rear wheels. You can have it with a six-speed manual as tested here, or a CVT with paddle shifters (why would you do a thing like that, though?!). Top speed is 140 km/h, about 87 mph, and 0-60 mph times are irrelevant. Unlike its predecessor the Beat, the S660 is more a targa top than a full convertible. The removable soft top can be stowed away in a compartment in the “frunk.” With the roof on, the compartment where the roof is kept can be used to put things in. But the odd shape limits the sort of things you can put in there. The S660 was launched in 2015 as a precursor to Honda’s current sports car lineup consisting of the reborn NSX and Civic Type R. The automaker wanted to show it still had its sporty mojo. The S660 showed its home market that Honda could still do well-engineered and quirky sporty cars that cost less than $150,000. While it doesn’t really matter to overseas markets, where the size of this thing is more of a scary thing than a selling point, how good is it to know that Honda are still capable of making a fun, affordable sports car? To me the S660 does as much for Honda’s sporty reputation as any Type R or NSX. Plus, if you ever travel to Japan, this is something to try and talk your way into driving. The best thing about this is car is the fun factor. Taking the roof off (which isn’t that difficult in itself, just unlock and roll up) and throwing the little roadster around like a rag doll was what it was made for, and it does that well. A week before picking up the S660, I was driving the Mazda MX-5 RF. The Honda was easier to throw around corners than the bigger Mazda. The size and handling meant you could do it literally anywhere. I had just as much fun throwing it around a mountain road as I did chucking it around the city and in parking lots. As tempting as it would be to own one of these, it does come with a few compromises. Honda probably didn’t want anyone adding any unnecessary weight to the car so they’ve made sure you can’t have any luggage in it. There’s literally no luggage space—the only place to hold your gear is the passenger seat. You can’t even have much of a drink, as the single cup holder inside the interior is just about big enough for a 750ml bottle of water. The Big Gulp stays at home here. The interior space is quite snug. Whereas most kei-cars do a good job disguising their smallness and even being quite practical, the S660 makes sure you know it’s a small car. There’s also little insulation so you can hear every noise from the outside and feel the heat coming from that tiny turbo engine. The engine itself isn’t bad; it’s quite peppy but it doesn’t scream and rev high like Honda’s previous sports cars. It could do with a bit more aural drama too. In-town driving is where the S660 really shines. At low speeds you don’t notice the double digit horsepower. Instead, all that matters are the admiring gazes from other people, light steering and the wind in your hair. Tokyo isn’t the best city to drive a manual in but the S660’s gearbox wasn’t an issue at all. The clutch wasn’t heavy. The buttresses, as awesome as they were, did hinder rear visibility. The narrow wing mirrors weren’t much help either. Good thing it had a pretty clear rear camera. For a small car it was surprisingly comfortable on a long-distance drive. I took on a 400 kilometer (249 mile) road trip to Nikko to test it on the Irohazaka Route. It never felt tiny at all. In fact, it was as solid as you’d expect from a Honda. It was stable at motorway speeds and I didn’t arrive with any backaches. The only issue was driving that distance with no roof. There’s quite a bit of wind buffeting, so you don’t really have conversations, just shouty exchanges. The fuel tank was small though, only 25 liters (about 6.6 gallons) which lasted around 400 kilometers. Amazingly, in the six days I had the car it only went through two full tanks. I wasn’t exactly driving economically, either. Even though it’s a pocket-sized sports car, don’t expect it to be a pocket monster. With an engine capped at 64 HP it’s not going to set your hair on fire. What it will do is put a smile on your face. A big one. I love a small, light, underpowered car that you have to wring out as much as the next driver, and the S660 doesn’t disappoint. It’s quite possibly the most fun you can have at 40 km/h, or about 25 mph. The chassis is a standout. I don’t know how it manages to find grip even when you’ve got it by the scruff of the neck but it never once stepped out of line, even with ESC supposedly turned off. The sticky Yokohama tires no doubt helped too. Steering was nicely weighted and responsive. Like most modern racks it could do with a touch more feel, as there were times where I wasn’t sure what the front wheels were doing but only at lower speeds. It’s the way the front goes into a corner and stays in was what really impressed me. It only understeers ever so slightly only when you’re beating on it. Then there was the gearbox. What an absolute joy it was to use. A tight, short-throw manual that could give the MX-5’s a run for its money. Even at city speeds I found myself changing down a gear just so I could shift back up again. The clutch movement smooth and easy, hop right in and you could find the biting point immediately. Compared to say, the MX-5, the S660 was noticeably lacking in power though. It’s not like you’re going to slow down traffic on the motorway—in fact overtaking could be done easily enough. It’s just if you’re after something that’ll slingshot off the lights, this isn’t it. In a low gear, foot flat to the floor, it just moves. It doesn’t fly, it doesn’t go into warp speed. It just moves. With the roof off and the slick gearbox, the sensation of speed was more thrilling than the actual speed you were going. There is space in the engine bay for a bigger engine—something like a 1.0-liter turbo with 100 HP would suffice. Honda fans who have been waiting decades for this comeback. People who prioritize handling over outright power. Car enthusiasts with nothing to prove. Fans of easy parking. I’m sure Honda wanted it to appeal to younger buyers, but most of the people I’ve seen behind the wheel of these probably had a Beat when it came out in the ’90s. The price is pretty high for a kei car. But then again, most keis are made for mundanity which ths S660 destroys. The leanest, least-optioned S660 lists at ¥1,980,000 (about $17,600). Its closest rival, the also-compact-sport-convertible Daihatsu Copen, starts at ¥1,852,200 ($16,482) but both get closer to Mazda Miata territory when you start adding options. The S660 is undoubtedly one of the best engineered kei cars out there, but my tester rang up at about $20,000. That’s only a few hundred thousand yen (a couple thousand dollars) short of a base MX-5 soft top which, in some senses, is a lot more car. Most Japanese drivers are attracted to kei cars because of their low ownership costs, and part of that goes away when you’re looking at the performance variant, just like in the U.S., where you’re never going to be able to get a Civic Type R for the price of a base model. 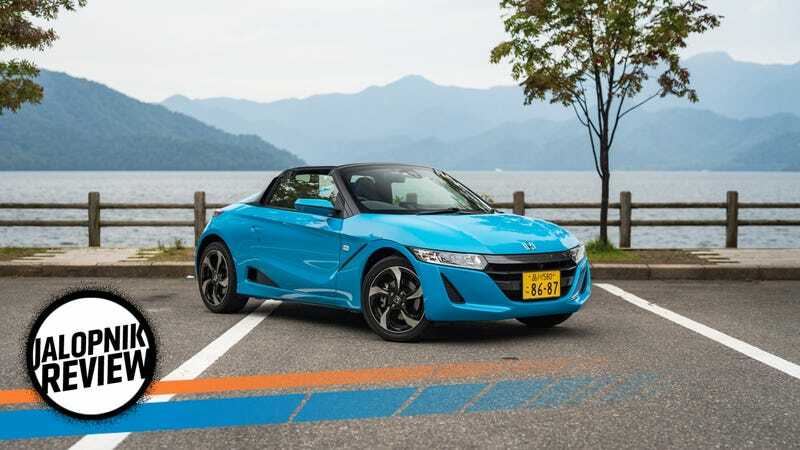 Honda seems to have recognized the niche appeal of the S660 though, and only planned on selling about 10,000 S660s a year when the model was launched in 2015. Yes, kei cars do have advantages such as cheaper road tolls, a road tax that’s roughly a quarter of a normal car, and cheaper insurance. All of which should be good enough to attract a much younger audience than Honda’s usual customers. However, at that price there won’t be too many high school and college kids queuing up for one of these. It also won’t work too well in a single-car garage. Driving it around on a day-to-day basis around town is fine. It’s only when you want to go on a road trip or even buy groceries are where things get tricky. You don’t get much in equipment, either. This top spec car came with bi-xenon headlights, a backup camera, Bluetooth/USB audio, cruise control, a G-meter, A/C, and a button that could change the color of the dash from white to red. That’s about it. All size-related flaws aside, this is the cheapest way to get into a brand new mid-engine turbocharged open top sports car with a manual gearbox. It’s not even comparable as a “mini-Ferrari” because not even Maranello has made a turbo midship with a true manual gearbox since the F40. The S660 is a car that makes no sense on paper. Kei cars came about as a way of offering cheap and basic personal transportation to the masses. The S660 laughs in the face of that while at the same time making you laugh as well. It’s a happy little car that you just can’t be unhappy driving. It’s not fast, it’s not practical, and it’s not available to buy new outside Japan. Buying one seems like more of an indulgence than a necessity. But if your necessities include low running costs and easy parking, the S660 could be a shining light of fun in your driving life. I’m glad it exists and glad to see a few on the road. I really hope Honda’s return to affordable sports cars doesn’t end here. Luggage limit is one water bottle.